Orlando, FL (February 7, 2019) - Today, Correct Craft accepted Habitat for Humanity Greater Orlando & Osceola County’s highest honor, the 2018 Walter Pharr Legacy Award, at the Cornerstone Guild Breakfast on the build site. 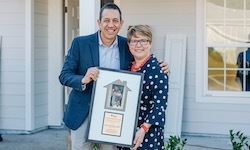 The Walter Pharr Legacy Award was created in 2016 to honor and recognize the founding of Habitat Orlando & Osceola by Board Member, Walter Pharr, and his spirit and passion to provide a hand up to families in need of affordable housing. The Walter Pharr Legacy Award is presented to an exceptional organization who partners with Habitat Orlando & Osceola through philanthropy, volunteerism and other vital support. Correct Craft joins Rosen Hotels & Resorts and Universal Orlando Foundation as Walter Pharr Legacy Award Recipients. Habitat for Humanity Greater Orlando & Osceola County partners with sponsors, donors and volunteers to build affordable housing, revitalize neighborhoods and strengthen communities. Habitat homeowners help build their own homes alongside volunteers and pay an affordable mortgage, achieving the strength, stability and independence to build a better life for themselves and their families. Neighborhood Revitalization efforts are tailored to address the vision of residents who take on leadership roles in their community’s renewal. Residents are empowered to revive their neighborhood through repairs, beautification projects, community cleanups and developing community partnerships to enhance their quality of life and to nurture their sustainability. Habitat Orlando & Osceola is one of Habitat for Humanity International’s affiliates working in local communities across all 50 states in the U.S. and in approximately 70 countries. To learn more about Habitat Orlando & Osceola, call (407) 648-4567 or visit www.habitatorlandoosceola.org, like us on Facebook/habitatorlandoosceola and follow us on Twitter @HabitatOrlOsc and on Instagram/habitatorlandoosceola.